Omwogezi wa FDC era omubaka wa Kira munisipaali Ssemujju Ng’anda (kkono) n’akulira abavubuka ba FDC Warid Lubega nga bali mu lukung’ana lwa bannamawulire. FDC eyagala Pulezidenti Museveni asattulule eggye lya SFC erimukuuma ng’egamba nti yalissaawo mu ngeri emenya Konsityusoni. FDC etiisizza okutwala ensonga eno mu kkooti etawulula enkayana za Konsityusoni ng’erumiriza nti okussibwawo kw’eggye lino kumenya Konsityusoni y’eggwanga (mu kawayiro 208) ekatakiriza muntu yenna kutandikawo ggye lyabwanannyini. Mu kiseera kye kimu FDC erabudde omubaka wayo Abdu Katuntu (Bugweeri) obutewaggula kugenda maaso na kukola mirimu gya bwa ssentebe bw’akakiiko ka COSASE akali mu kubuuliriza ku by’okuggalibwawo kwa bbanka z’ebyobusubuzi ng’egamba nti yamusindika dda ku kakiiko akakwasisa ababaka empisa n’emusikiza Mubarak Munyagwa. Omwogezi wa FDC Ibrahim Ssemujju Nganda bino yabitegeezezza mu lukung’ana lwa bannamawulire e Najjanankumbi ku Mmande. Mwe yasinzidde okutegeeza ng’eggye ly’eggwanga (UPDF) bwe lisanidde okulekera awo okukuza olunaku lw’okutandikibwawo kw’olutalo lw’e Luwero olwa Febuary 6 kuba eggye lya NRA eryatandika olutalo lyaggyibwawo dda ne lisikizibwa erya UPDF mu Konsituyusoni. Ku by’akakiiko ka COSASE, Nganda yagambye nti FDC egenda kuwandikira sipiika Rebecca Kadaga emubuulire ku bulabe bw’okuleka Abdu Katuntu ng’akola emirimu gya ssentebe w’akakiiko ako kuba gyamuggyibwako ne giweebwa omubaka wa Kawempe South , Mubarak Munyagwa. Mubaka Ssemujju webale omulimu okutereza ebikyamu governmenti eno byekola. Kiringa kuteeka mazzi mu kisero. Kubanga yo ekoye. Kyandiyambye okuyita abasobola bonna okusisinkana. Wabewo okutesa ensi eno etandike okutunulira Transitional Governmeti nga eyo eyatekebwawo nga Amin adduse. Amagezi gajja kufunika agasobola okutagulula obuyinza buno nate wano e Buganda. The European Union (EU) has said they support President Yoweri Museveni’s stand on the planned amendment of the land law because there is need for a serious regulation to govern land use and acquisition. Speaking during a courtesy call to Ministry of Works and Transport on Tuesday, the new EU Head of Delegation, Mr Attilio Pacifici, said he is irritated that the cost of constructing the Northern Bypass doubled since land owners inflated the amount of money they were supposed to get. “I think what the President [Museveni] is doing to sensitise people is very important. There is need for a strong law to allow government acquires land for projects of national strategic importance,” he said. He said such a law would not provide room for discussions with land owners because it caters for adequate compensation and where some of the land is not utilized, it reverts to the owner because most times, its value appreciates when the project is complete. The ambassador, who is a month old in the Kampala office, was paying a courtesy call to ministry officials to evaluate projects that are funded by the EU. The proposal to amend Article 26 of the 1995 Constitution to allow government take over private land before compensation has met opposition from some members of the civil society, church leaders, Members of Parliament, ordinary people and a section of politicians. The critics of the plan argue that if land is acquired before compensation, owners may not get proportionate payment from the government. President Museveni says amending the article is not intended to steal people’s land but to hasten government projects that have been stalling as a result of court cases arising from compensation disputes. Subsequently, President Museveni embarked on a countrywide tour to explain the plan to Ugandans on various radio stations. EU funds among other projects, the Masaka--Mbarara--Katuna, Mbarara bypass, the Kampala-Jinja Expressway and the Southern bypass. Ms Monica Ntege Azuba, the Transport minister said the EU has also earmarked funds for the Lake Victoria Transport System specifically to improve infrastructure in Port Bell as well as rehabilitation of the Tororo-Gulu Railway line. “We appreciate your courtesy call. It is very rare that we get visitors who come to give us support where we find challenges,” she said. The European Union is well aware of the corruption that is going on concerning who exactly owns the land on the African Continent and therefore needs some sort of compesation! The days seem to have gone when on this continent all sorts of people walked in and out and made claims of ownership on any thing that existed on this continent. Local African communities can and are well educated to give for free land for the common good of their peaciful communities. In dilemma. Some of the residents of Naluvule village in Nakaseke District who have been threatened with eviction, gather for a land meeting recently. PHOTOS BY DAN WANDERA. The State of Buganda, Nakaseke. Mr John Bahigi, 68, a resident of Kinyogoga Sub-county in Nakaseke District, owns more than 80 acres of land with a lease title. His family has stayed on this land since 1961. He was, however, shocked after strangers turned up from nowhere in 2016, to claim ownership of his land. They confronted him with instructions to survey the land his family had occupied for 55 years. The suspicious people, in 2016, displayed a land title similar to the one in his possession, claiming ownership of his land. “After cross-checking that the land title I had was the genuine one from the office of the registrar, I walked up to the office of the Commissioner of Lands to register my complaint. I was tossed around for more than six months,” Mr Bahigi narrates to Daily Monitor. “Lucky enough, the registrar had already verified within the Lands ministry system that the title I possessed was genuine. When they turned up for surveying for the second time, I alerted other residents and we arrested them and handed them over to the police. This was the last time I heard about them,” Mr Bahigi further narrates. Mr Bahigi said he suspected connivance from the Ministry of Lands for the double issuance of two land tittles on the same piece of land. Mr Joseph Ssentamu, 55, another resident of Nabbika village re-echoes a slightly similar challenge. He claims his family has settled on land measuring 100 acres since 1948, only to receive an eviction notice from Buganda Land Board Ltd, a corporate body mandated by the Kabaka to manage the Buganda Kingdom land. “I was surprised when people claiming to be agents from Buganda Land Board told us to vacate the land, claiming that it had been leased out. Surprisingly, the 100-acre land on Plot 1,029, Nabbika Estate, is also claimed by Nakaseke District Land Board. We are surprised that Mengo does not know where their land ends. Our relief is that Nakaseke District Land Board has taken over the matter. We also recently received a message from Mengo disassociating themselves from eviction threats on this land. We are left with unanswered questions about who was behind the destruction of our property, including food in an effort to force us off this land,” Mr Ssentamu said in an interview. 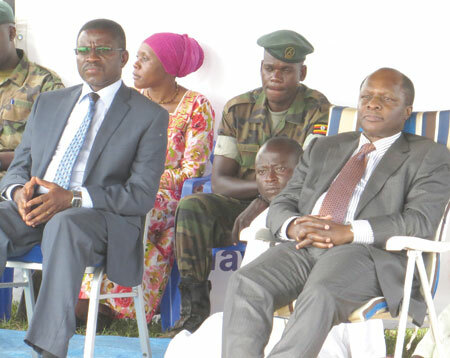 But the Buganda Kingdom information minister, Mr Nuwa Kiyimba, told Daily Monitor in an interview on Friday that whatever interventions Buganda has made regarding land registration and management programmes is in the best interest of the people of Buganda. Two months ago, Nakaseke South MP Ssemakula Lutamaguzi raised a red flag in Parliament. He said more than 20,000 people had been evicted from five villages in Nakaseke South and many others were living under fear of eviction from their land. He claimed that well connected people, whom he did not name, were behind the evictions and called on government to investigate the claims. Deputy Attorney General Mwesigwa Rukutana, however, denied involvement of “big shots” in government in land grabbing. Local leaders have stepped up advocacy about their plight but feel government has turned a deaf ear. Like Mr Lutamaguzi, they point to some powerful officials, including soldiers who have made it a habit to evict bona fide tenants from their land with impunity and without following the law. Analysts attribute the problem to the fact that there is vast idle land available in areas such as Nakaseke, which attracts people from other parts of the country to settle on it thinking it is vacant land. But local leaders claim the problem is a result of speculators, especially those in government, who buy huge pieces of land with a plan to sell it in future at a higher price, but the land has sitting tenants and they fail to compensate them. 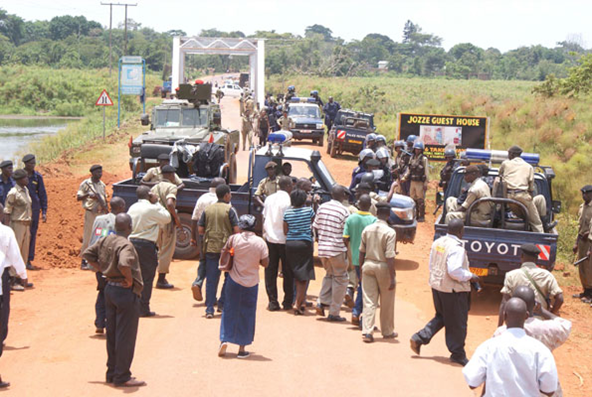 Mr Fred Rwabirinda, the Nakaseke District councillor representing Kinyogoga Sub-county, claims senior government officials working with top security agencies, have fenced off vast areas in the district, leaving residents without land for farming and grazing. The most affected areas include Nabbika village, where 200 families are threatened with eviction, Naluvule village, where 400 families face eviction and hundreds of others have already been pushed off their land. In the neigbouring Luweero District, the situation is not different. 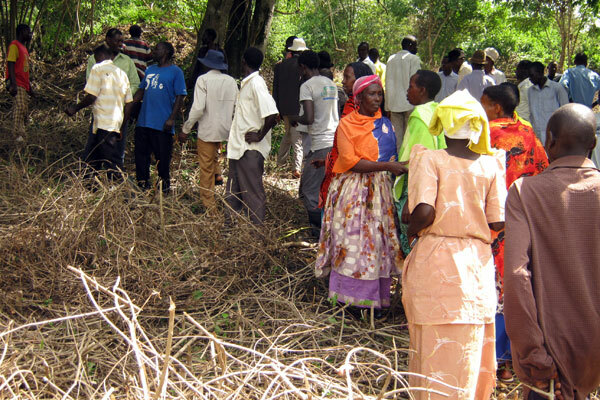 A total of 2,000 families were also recently issued with an eviction notice to vacate a piece of land measuring 14 square miles in Kakulubita Sub-county. Recently, President Museveni instituted a commission of inquiry into land matters led by Justice Catherine Bamugemereire. Nakaseke District is a hotbed for land disputes. The district sits on 3,477.3 square kilometres of land, according to Mr Kato Ramathan, the district information officer. The district has an estimated population of 208,000 people, according to the 2016 District statistics, although the 2014 Population and Housing Census put the population at 197,369. The population in Nakaseke depends on farming and cattle keeping for a livelihood. Ate waaliwo n'ekibiina ky'Abataka ekyayitibwanga BATAKA UNION (BU) nga kikulemberwa Omutaka Semakula Mulumba. Kino nga kiri wamu n'Abataka abatali batongole mu Lukiiko lwa Buganda nga baateranga okulumba Kabaka Muteesa II ne governmenti ye ku buli nsonga yonna gye bayagalanga okukolako n'okusingira ddala okwefuga kwa Buganda. Nga bwekimanyiddwa mubyafaayo bya Buganda, ekibiina kino kyakola nnyo okusooka okulwanirira Muteesa II bwe yali awaggangusibbwa ate era ne Uganda okutuuka okufuna okwefuga kwayo bwe yetakkuluza ku Bungereza. Nga 24, April 1949 abantu bangi nnyo baava wonna mu masaza ga Buganda. abasajja n'abakazi, ne bagumba ku nnyanja ya Kabaka awo okumpi n'essomero lya Aggrey Primary School. Ekyali kibaleese awo nga we baagala okuva okugenda okulaba Kabaka bamutegeeze ebibaluma era abibakolereko. Bajja beetegese okubeera awo okutuusa lwe baliraba Kabaka kubanga baalina buli kye balyetaaze gamba ng'emmere n'ebyo'kufumbiramu. Baali bawera nga 5000 obungi era nga kirabika abakulembeze baabwe baali bamaze ekiseera nga beetegekera olugendo luno. Baali tebajja kutiisibwatisibwa okuva mu kifo ekyo okutuusa nga Kabaka amaze okubakolera ku nsonga ezaali zibaluma. Governmenti Enkuumi eya Bungereza bwe yalaba embeera eyo ng'abantu bazze gawanye n'ewereza police okukuuma olubiri. 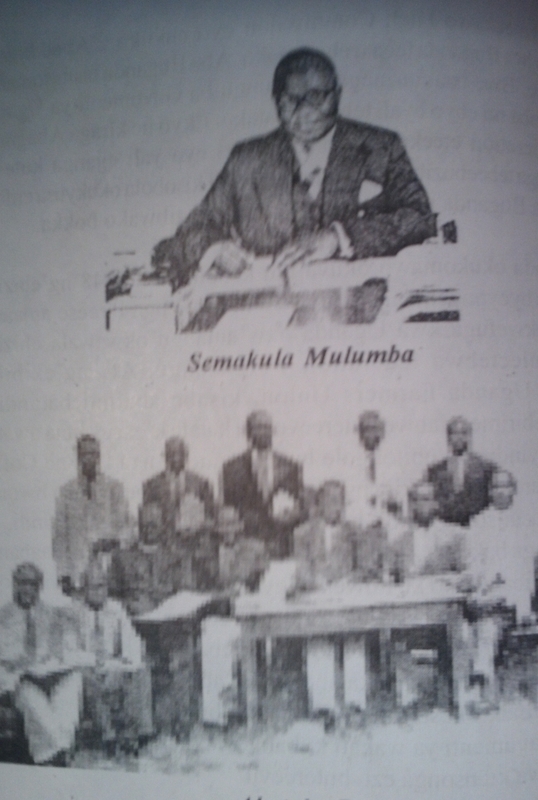 Enkeera nga 25, April 1949, abantu abo abaali basuze awo ku nnyanja ne bagumbulukuka ne bagenda mu maaso g'olubiri okutandika okukola ku kyabaleese. Baatumira Kattikiro agende ayite Kabaka ajje bamutegeeze ebibaluma. Kabaka Muteesa II yali nga bayinza okumukola akabi. Abakulu abamu baali bawadde Kabaka amagezi abantu abagobe aleme kubalabira ddala naye n'agaana nga bw'agamba nti, BWE BABA BAAGALA KULABA KABAKA WAABWE BAJJA KUMULABA. MUBAGAMBE BALEME BONNA KWEYIWA MU LUBIRI WABULA BALONDE (ABABAKA) MUNAANA BAJJE BANTEGEEZE KYE BEETAAGA. 1. Ssaabasajja akkirize abantu baweebwe obuyinza okwerondera abaami babwe. 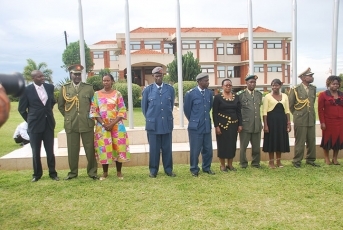 2.Gavumenti ya Kabaka eriko yonna eggibweko. 3.Abalimi bakkirizibwe okwesunsulira pamba wabwe. 4. Abalimi baweebwe eddembe okwetundira ebirime byabwe mu butale ebweru. 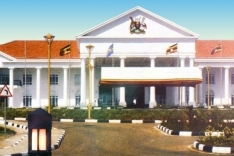 Ensonga 1,2, 3, zaali nzibu okukolako amangu kubanga zaali zeekuusa ku Ndagaano eya 1900 eyaliwo wakati wa Buganda ne Bungereza. Naye ensonga ezisigaddewo nja kwebuuza ku bampa amagezi nga sinnaba kuziddamu. Kabaka Muteesa bweyasubiza bwatyo. Bwe yamala okkubaddamu n'abagamba baddeyo mu maka gabwe ng'ensonga ezo bwe zikolebwako. Ababaka b'abantu baava ewa Kabaka nga bamatidde n'okuddamu kwa Kabaka. Bagenda okunnyonnyola bannabwe n'okubasaba bagumbulukuke. Abantuuze ba Buganda bano baagaana okuvaawo. Ebiddako bya Kabaka wa Buganda kufuuka NKATA NNYIGWA WABIRI. Eno nga abantu be balowooza nti Kabaka ne governmenti ye tabaliko era nti ali nabano abajja bazunga(Abangereza), ate nga yo gavumenti ya bazunga enkumi ng'erowooza nti Kabaka Muteesa tagiyamba nga yekkubira nnyo ku Lukiiko n'abantu be natayamba mu nteekateeka zankulakulana z'ensi bannamawanga bano(abagenyi) zebaali bakolera ensi Buganda ne Uganda. Anti olutalo lwe Bugerere tewali atalujjukira. Disillusionment with Mengo rarely gets voiced publicly among Buganda’s clan heads (Bataka). But a decision by Buganda kingdom to stop them from attending this year’s Ttabamiruka convention in New Jersey, United States, is meeting strong opposition. Last year, Mengo officials skipped the convention over similar disagreements. Denis Walusimbi, Buganda kingdom’s spokesman, told The Observer yesterday that the kingdom would not take part in this year’s convention. Katikkiro Charles Peter Mayiga, however, is expected to tour parts of Canada, Chicago and Boston between August 31 and September 8. They also doubted whether the Kabaka indeed authored the said letter. 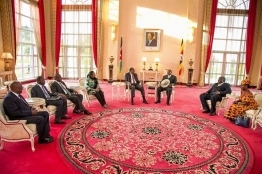 When they met the Kabaka recently and reportedly told him about their plans to attend the convention, he did not raise any objections, they said. The clan heads argued that the decision to bar them from attending the Ttabamiruka was not different from the central government’s decision in 2009 to block the Kabaka from touring Bugerere. This email followed one written by Lule-Mukasa on July 2, in which he accused Sekamwa and other officials of building factions among Baganda in the diaspora. Lule-Mukasa accused Sekamwa of doing nothing to heal the divisions. A dispute between the ministry of Defence and Finance over a 16-acre piece of land in Mbuya has become the focus of a parliamentary probe. The committee on Commissions Statutory Authorities and State Enterprises (COSASE) last Thursday launched the investigation into the dispute that pits the ministry of Defence and the ministry of Finance-supervised. National Housing and Construction Company (NHCC). Both ministries claim ownership of the land, which houses Mbuya barracks and the ministry of defence headquarters. When NHCC officials, led by the Chief Executive Officer Parity Twinomujuni, appeared before the committee last week chaired by Bugweri MP Abdu Katuntu, they said the two ministries are currently in court. NHCC officials appeared before the committee to answer queries raised by the auditor general’s report relating to land in Kireka and Mbuya among other issues, for the financial year ending December 2014. Since the two ministries are both under government, it implies that government has sued itself and two ministries are represented by the attorney general. Twinomujuni however, told the committee that the different ministries have since opted for private lawyers after they failed to settle the land dispute out of court. NHCC is a part privately and publicly owned entity with government owning a 51% stake while the Libyan African Investment Company (LAICo), a private investor, owns 49%. Twinomujuni said that after an out-of-court settlement failed and since each ministry has a land title for the same land, the ministry of finance instructed NHCC to go to court. “We want it [Mbuya land] back. We have tried to settle outside court in vain. By the time you go to court you have failed but with [MPs’] your assistance, we can still start afresh. Nobody wants to be in court for sure,” Twinomujuni said. “You [NHCC] now go to court because there is a dispute of ownership of land with the ministry of defence: We find that very, very strange. There should be no circumstances under which government ministries sue each other. That should not arise under any circumstances,” Katuntu said. The committee plans to summon the ministers of Defence, Finance and the Uganda Land Commission boss Baguma Isoke to appear and ascertain who the rightful owner of the Mbuya land is. Ministers Adolf Mwesige (Defence) and Matia Kasaijja (Finace) will have to pinpoint the rightful owner of that land and the Uganda Land Commission boss Baguma Isoke will tell the committee why his office sanctioned the issuance of two land titles for one piece land to two ministries. “I think one department is becoming a conman which is very, very dangerous and I think we will have to eventually talk to the ministry of defence and ministry of finance. They are embarrassing us. The committee is going to invite both of them and put them to task why they cannot resolve the matter and end up going to court,” said Katuntu. How come some stranger guys match in like Christopher Columbus did and say all those beautiful mountains are mine and on behalf of my King! State House is one of the government departments that owe the National Housing and Construction Company (NHCC) Shs20 billion for rent. The others are the Ministry of Defence and the Uganda Land Commission (ULC), according to NHCC’s chief executive officer Parity Twinomujuni. This newspaper was not immediately able to establish how much each of them owes NHCC. Mr Twinomujuni said once NHCC receives the rent, it would channel it to low–cost housing. Attempts to reach the senior presidential press secretary, Mr Don Wanyama, and Mr Baguma Isoke, the chairperson of the Uganda Land Commission, were futile. Whereas Mr Wanyama is reportedly out of the country on official duty, Mr Isoke neither picked nor returned our calls. When contacted, Mr Frank Tumwebaze, the Minister of Information and Communication Technology, said he could not authenticate NHCC’s claim. He was not privy to its claim documents, he said. He added that each of the government ministries being demanded money knows and has capacity to know the truth a bout the claims of the company. “If the claims are genuine, it’s the responsibility of the affected agencies to settle their liabilities. If the claims are not genuine, the concerned ministries and agencies can dispute them. There must be a documented process of how those liabilities were incurred,” Mr Tumwebaze said via email on Thursday. The State minister for Housing Chris Baryomunsi, who affirmed some government department’s owe NHCC money, said he would see to it that the departments pay.